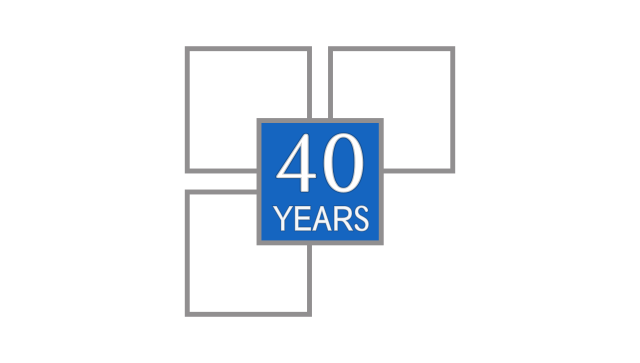 On 16th September, 2016 Fenwick Software will complete forty years in business. We are going to have a party to celebrate with our clients. In the meantime, you will notice that our logo has undergone a temporary change. We have inserted “40 years” into the blue square. In 1976, the IT industry was dominated by the hardware firms, IBM and the Bunch – Burroughs, Univac, NCR, Control Data and Honeywell. Software was mainly written in-house and smaller firms used Service Bureaux, such as Kim Jelbart’s Adaps, to process their accounts and their payrolls. Professional firms, mainly the leading chartered accountants, offered IT consulting services but seldom wrote any software. 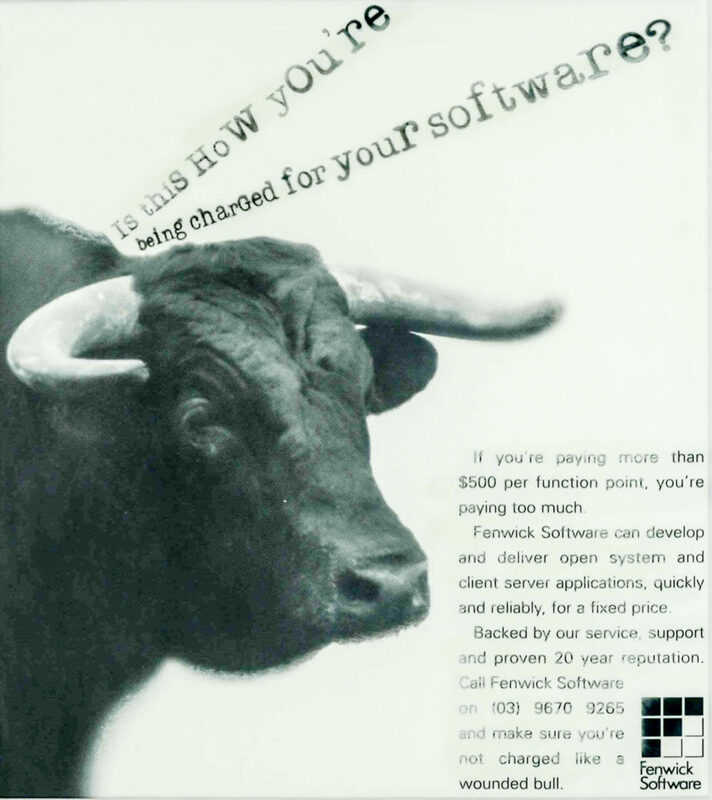 Software companies were in their infancy. Ormond Browne started International Programming; Harry Douglas set up Datec. These firms wrote software as requested but rarely designed improved solutions. If you are paying more than $500 per function point you are paying too much. 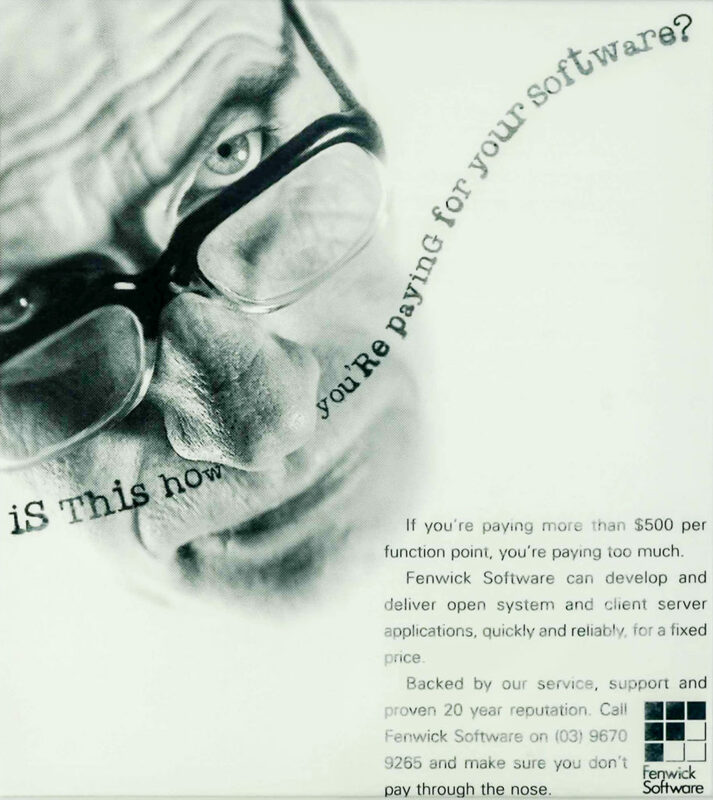 Fenwick Software can deliver open system and client server applications quickly and reliably for a fixed price. One of the enduring memories of our early successes was the way we engaged with client staff. Before we could custom build the software, we had to understand how the business worked or wished to work. In this systems analysis phase we undoubtedly brought to bear our own ideas on what was possible – for instance, applying operations research techniques to improve inventory control. But we also incorporated the wisdom of staff who knew the peculiarities of their own business. With regard to technology, the late seventies was still the age of the batch system. So we were breaking new ground as we built early on-line systems on HP 3000s and DEC VAXs. Mike Dorahy, Murray Doyle and staff from Bell Bay on their way to Boyne Island, as we developed a production system for Comalco’s new smelter. 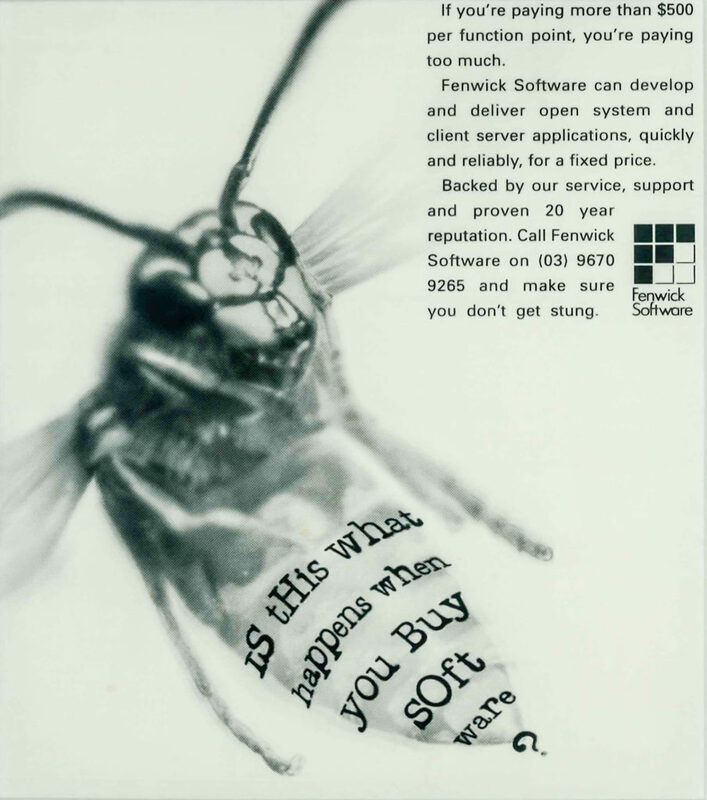 In the nineties we experimented with using package software as the foundation of a solution. It was like using prefab components for a building. It reduced the duration of the project and the cost. Gradually the quality of these packages improved and the best of them began to dominate their sector. In 1998, our team evaluated Navision and declared it better than anything we had ever written. In 2003, Bill Gates bought the company recognizing that the software was better than anything Microsoft had ever written! Today, as Microsoft Dynamics 365 Business Central, it forms the base for most of our client solutions. When I began the company in 1976, my aim was to provide both business consulting and software services; to be able to help client businesses by designing improved systems and procedures, and then to implement them. Forty years later that is still what we are doing. Nowadays, there are those in our industry who believe packages can be implemented by rote. Their sole aim is to get the new package solution up and working as quickly and as cheaply as possible. Drop and run. Install, show you which buttons to push, and leave. What a missed opportunity! The Dump and Run approach delivers only a fraction of the potential benefits. It is still important to perform the systems analysis phase like we used to do when we were developing custom-built solutions. Here is why. The implementation of new systems is the opportunity to engage client staff in their business; to get them thinking about how to improve their processes. If you get this right you gain a continuing benefit. They keep thinking. They keep improving their systems. The business becomes more efficient, and more profitable. In implementing ERP Systems, our role is firstly to understand the technology and what it can do for our clients’ businesses, and then to understand our clients’ businesses so that we can devise ways to use this technology in the most effective way. It is our responsibility to engage client staff in the thinking process, to facilitate discussions about what is possible and how in collaboration we might design improved processes. Engaging client staff in business process improvement is the most enduring benefit we give our clients. When I began the company in 1976, my aim was to provide both business consulting and software services; to be able to help client businesses by designing improved systems and procedures, and then to implement them. Forty years later that is still what we are doing. But because of improved technology, we write less software and the solutions are built quicker, more reliably and at less cost. In the past decade, most of our innovative efforts have gone towards improving the implementation process, to increasing the chances of project success. Furthermore, our metrics, based on forty years’ experience enable us to estimate much more accurately. 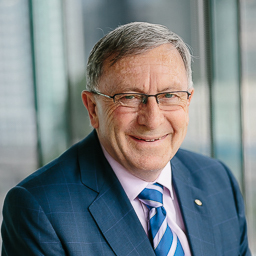 By the time of our birthday, it will be five years since I retired, set up an employee shareholder scheme and handed over to Greg Galloway. The firm is thriving under his leadership and is looking forward to delivering systems that work from people who care for many years to come. Underlying our work, over forty years, is a belief system that has guided all that we do. The culture of Fenwick Software is built on the principles of classic liberalism, on the concepts of human dignity. Our employees are granted an appropriate degree of autonomy, provided with opportunities to grow and assume more responsibility, and encouraged to apply their skills to help each other and to deliver value to their clients. This is the secret of the success of Fenwick Software and the prosperity of its clients.